Thecoolestmoviesearch.com is nothing more than a browser hijacker that can attack your personal computer without a warning. It is spread without users’ consent and takes over their favorite browsers. The PUP (potentially unwanted program) can also do a lot of modifications to the browser options, and you will find out about them only when you open your Google Chrome, Mozilla Firefox, or Internet Explorer for a surfing session. The browser hijacker can be compatible with lots and lots of browsers and, unless you remove Thecoolestmoviesearch.com from your system completely, will proceed to haunt your browsing. Your new tab window, default search provider, and home page will be changed forever if you do not take action and do not uninstall Thecoolestmoviesearch.com as soon as you notice its presence on your PC system. The website can be considered rather dangerous because it might be responsible for a number of other PC infections that computer users complain about. The home page can actually look rather nice if you just take a look at it, especially because it has lots and lots of shortcuts to a wide variety of websites. For example, you can see links to Facebook, Gmail, Instagram, Amazon, Youtube, Netflix, etc. 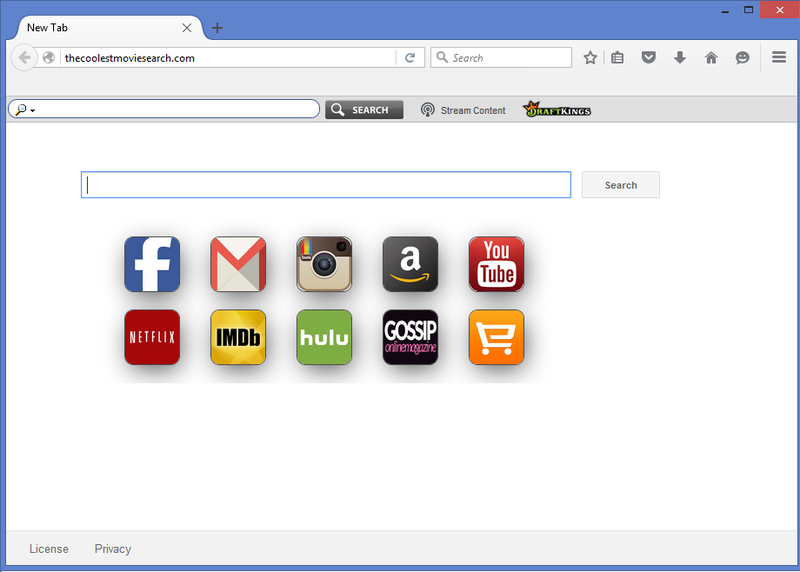 However, you can always bookmark your favorite pages, so you do not need a browser hijacker to do it for you. You see, the PUP displays threatening advertisements that can heavily damage your device. When you start browsing, you can see that you are being redirected to yahoo.com with many sponsored links in the results. The links usually redirect users to dangerous pages where people can get infected with viruses. Moreover, you can expect an abundance of commercial and non-commercial advertisements on visited webpages. These ads can easily attack and infect your system with all kinds of malware. In addition, the browser hijacker collects non-personally identifiable information. This means that it can gather your search history and use it for advertising. Delete Thecoolestmoviesearch.com if you think this cannot be tolerated. How did my PC get infected with Thecoolestmoviesearch.com? The potentially unwanted program is usually distributed with malicious installers in free software bundles. In other words, people download it accidentally, usually from P2P sites. If you want to avoid this, you can choose the Advanced or Custom mode of installation on the Installation Wizard. If you do not miss any steps, you will not have to deal with annoying applications anymore. How to remove Thecoolestmoviesearch.com from my computer? Thecoolestmoviesearch.com removal can be best done automatically. If you download and install a reliable anti-malware and anti-spyware application, you can easily erase Thecoolestmoviesearch.com once and for all. However, you should not forget that anti-virus programs have to be updated constantly. This means that you have to actively take care of your online safety: do not visit suspicious websites and upgrade your security tool.